Like many others, I seek out some of the books I most vividly remember from my childhood for a bit of nostalgia and to see if reading them again as an adult provides the same experience. Zeralda's Ogre, written and illustrated by Tomi Ungerer, (NY: Harper and Row, 1967) was once such blast from my past that I recently found at a library book sale and yelped over at first sight. My copy is worn, torn and full of librarian desecrations, but it is now enshrined in a place of honor in my bookshelves at home. I remember borrowing this book numerous times from my local library long after I outgrew a respectable age to check out children's picture books, but I loved reading it over and over and gazing at Ungerer's hilarious illustrations. It's a great fairy tale about a plucky young farm girl named Zeralda who conquers a kid-eating ogre with her culinary skills. She eventually ends up marrying him, which I remember thinking was icky even way back when, but I loved poring over the zany illustrations of what she cooked up. Think Brothers Grimm mashed together with the colorful, exuberant Sixties graphic design sense of Ungerer's better known artist colleagues like Milton Glaser or Seymour Chwast. Zeralda's food is over-the-top "Gourmet", festooned with encrustations and garnishes. I remember my child self thinking a roast chicken with red high heels was rather fetching and it still makes me grin today. How about that "Pompano a la Sarah Bernhardt" below? Ha! I really wanted to recreate this dish for my homage to Zeralda post here, but all those lurid colors had me stumped. I could make a crispy whole fried fish Asian-style with the head and tail still attached, lounging in a puddle of black bean sauce, but the sauce in the illustration really looks more like a chocolate sundae topping or mole. Molded rice timbales might work for those little cylinders surrounding the fish, with roasted asparagus curled up at the base, but then what would I do about those lavender, pink, mint, yellow and blue stripes adorning the fish body? It all sounded too complicated and frankly, somewhat inedible, the more I pondered the Pompano Project. Instead, I decided to make something riotously colorful and festive but still tasty, and so I put together a version of Antipasto Kebabs to bring to a party recently. There are many versions that one can make, depending on the type of pickled, salty snacks you prefer, but the key is keeping a nice color balance and finding appropriate-length toothpicks to spear them with. I finally found a nice package of four-inch toothpicks (standard sized toothpicks are really too small and bigger wooden skewers go beyond finger food handling). If Zeralda had made these skewers they probably would be sticking out of a purple cabbage or some kind of crazy edible ziggurat, but I chose an antique china plate instead for my base. And the ogres I served them to ate them all up. These kebabs can also be drizzled with a little vinaigrette right before serving, and/or garnished with a little snipped parsley. 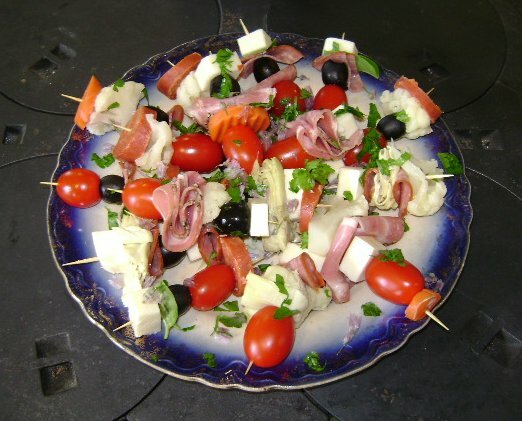 The artichoke hearts were a little floppy and the kebabs with giardiniera seemed to be gobbled up last, so I would go with more of the popular mozzarella and salami combinations in the future. This post is my contribution to Novel Food, a semi-annual blog event hosted by my blogger buddy, Simona of Briciole. For Novel Food, one can submit a food post that derives inspiration by any literary work. If you would like to join in the fun, you can do so by the deadline of July 1, 2013, or wait until the next edition of Novel Food. I may have to look for this. I love vintage stuff (and now my childhood faves are officially vintage!) :) It looked to me like there were pineapple rings with cherries atop the "Pompano a la Sarah Bernhardt". I was wondering how you were going to pull that off. What a fun book! I can imagine it grabbed your imagination as a child and I am glad you got a copy to keep on your bookshelf. The graphics are so cute. I think natural color are much better. We could use purple potatoes to make blue mashed potatoes. Thank you so much for your contribution to Novel Food! You are right, these are great illustrations. I believe no books have a stronger impact on us as the books we read when we are children. As for Zeralda marying him, I would have to agree with you on that one. Icky! Your kebabs would be a great hit in my house. We love any type of food on a stick. Great for a summer get together! Eeek! I know Tomi, but don't know this book~I shall have to find a copy and read it! I love your food interpretation. And agree it would be really fun to completely recreate that feast! I love the illustrations and your colorful antipasto kebabs fit right in. Great pick!